Treating some of the more challenging muscularly compromised TMJ patients will certainly put to test the effectiveness of any appliance whether it be a splint or an anatomical orthotic. The effectiveness of TMJD therapy is also dependent on how the occlusal scheme of that appliance is designed and managed. Flat plane splints, soft splints, hard splints, upper splints, lower splints, anatomical, partial coverage, or full coverage are all used in dentistry giving varying results depending on: 1) the philosophy of the dentist/surgeon, 2) doctors skills, understanding and abilities to manage the occlusion/the bite of the patient, 3) doctor and patients understanding of muscles role they play in mandibular posture, joint postural conditions as well as head and neck postural conditions, and 4) what level of quality appreciation does the doctor have relating to the patients proprioceptive occlusal details (some patients are more detailed than others). The results will vary. The masticatory muscles with the built in proprioceptive mechanisms within the muscles, teeth and joints will seek a terminal tooth contact not only in the vertical position but also in the sagittal/AP and frontal/lateral planes, anterior and posterior teeth. Mandibular torque (pitch, yaw and roll) also need to be considered in allowing the muscles and neuromuscular mechano-proprioceptive mechanism to function optimally. Temporalis muscles pull the mandible in an up and back position. Just as some dentists astutely have recognized the gearing of the occlusal surfaces is not present in a flat plane appliance, than how will the AP posturing of the mandible maintain itself, especially when the AP is most critical for the temporalis muscle to maintain an isotonic neuromuscular path of closure? Cases with severe muscle contraction involving hyperactive temporalis and masseter muscle groups along with cervical bones (atlas and axis) rotations and kyphotic mal alignments will certainly win and retract the mandible posteriorly and superiorly without optimal (anatomical) gearing. The strength of these strained and torquing muscles will overcome an optimal antero-posterior (AP) position distorting an optimal anterior vertical posture of the lower jaw as well as the posterior vertical occlusal dimension between the upper to lower jaws. This is why clinicians have learned by clinical observation that worn posterior second molars will further result in worn and rubbed out splints reproducing holes in the posterior region of splints over time. Patients who clench on their teeth often report that soft splints that were prescribed actually makes the condition worse. The flat plane split concept does have a place in treatment and maybe found simple and effective during initial emergency treatment, but remember it does not effectively address the AP myo-trajectory (jaw closing path) requirements of maintaining optimal muscle of all the muscles of mastication which include the lateral pterygoid, medial pterygoid muscles (internal muscles that connect to the condyle, articular disc and greater wing of the sphenoid – just posterior of the eye sockets) as well as occlusal occlusal signaling responses that are required. An anatomically correct anterior and posterior vertical dimensions of the human jaw is of significant importance to allow muscle strain, torques and skews to be at their minimum (as nature intended), especially if joint degeneration and or derangement problems exists. Physiologic design and anatomical form must be present in any appliance if one’s goals and objectives is to bring the muscles to their neutral and relaxed functional position effectively. When muscles are strained these occlusal dimension microscopically also change. When muscles are relaxed the anterior as well as the posterior occlusal dimensions also microscopically change. (Many dentists/surgeons miss this understanding and concept). Thus, the common second molar grind-in and adjustments are done in this region routinely upon initial delivery of the traditional “splints”. The patient must ask why does they dentist/surgeon have to grind on the second molar region if they have achieved a proper maxillary to mandibular jaw relationship for treatment during bite record taking? Or have they not found the proper jaw relationships and rather allow the spastic musculature to seek that idealized jaw relationship over time? (Thus the repeated follow up adjustment grind-in visits). Splints often prescribed by dentists do not adequately address the proper muscle and joint position of their patients to physiologic parameters. Most dentist/surgeons do not use technology that helps them “objectively” measure physiologic muscles responses or pathologic jaw positioning problems to determine ones optimal jaw position (especially the antero-posterior and frontal/lateral) even if they are using MRI or CT scanning technology. MRI and CT scanning does not determine ones physiologic jaw position. It does help doctors identify soft tissue articular disc problems but does not identify a TMJ patient’s jaw position neither an optimal physiologic muscle position. Dentist/surgeons are at best designing for their patient’ a “best guest” or estimated jaw position they “think” is a reasonable position for one’s TMJ condition”. This kind of reasoning hopes that the patient will compensate and or accommodate to the discrepancies not identified. 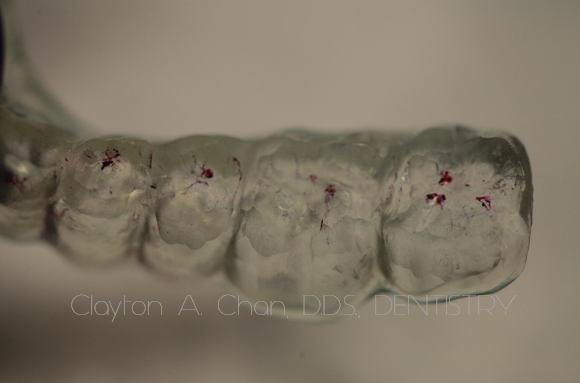 Any gross occlusal adjustments done by the clinician on a splint is done with the hopes that the blue paper marks are going to be satisfactorily even and balanced to hopefully satisfy the proprioceptive feelings of the unsuspecting discriminating micron patient. Is this good enough? Is this the standard of care? Are dentist working to physiologic anatomical parameters designed by nature…or is the dental profession really diagnosing and treating to physiologic standards? If patients and doctors could simply understand this fundamental jaw relationship principle that muscle strains and torques play a tremendous role in how the upper and lower teeth fit together in various dimensions (AP, vertical, lateral, pitch, yaw and roll), most doctors would eventually realize there is no need to guess where the patients jaw relationships should be. Objective measurements using technology can help overcome these issues if proper training in these neuromuscular concepts are comprehensively understood. Having the “pot shot” hope that some splint will remedy the muscle hypertension and torquing movements during chewing and resting modes may not always be the case. If the splint or orthotic does not feel comfortable in one’s mouth the patient should realize that something is wrong. It is not a matter of “getting use to it”. Either the jaw position/relationship is not right and/or the way the bite of the splint or orthotic is not properly adjusted to match and fit the physiologic parameters of relaxed muscles has not be properly addressed to allow muscles to calm and support an improvement in head and neck postural alignment. How can this be right? Any occlusal appliance no matter what the philosophy of the treating dentist/surgeon should bring optimal physiologic functional as well as optimal resting calming modes to healthy parameters within a reasonable time period. The goal of appliance therapy is to reduce TMJ’s restriction and reduce temporomandibular dysfunction. If the prescribed appliance is not meeting those goals and objectives, something is dramatically wrong and should be re-evaluated by your dentist. There is no need to tolerate discomfort for the long term. A flat plane splint usually positions the jaw in a back (posterior) position. The hyperactivity of muscles over-ride the flat plane occlusion and jaw position not allowing the muscles, especially the temporalis anteriors to decrease in activity (EMG recordings can show this). Flat plane splints do not always achieve a physiologic jaw relationship (Jaw tracking, EMGs and TENS can also validate this). They do not establish a physiologic occlusal jaw relationship and more often than not do not always help support optimal physio-therapy, chiropractic structural body alignment, neither do they help support optimal sacral occipital body alignment. (this gives reason why numerous adjunctive visits are required because the postural alignment is not holding stable. What may be missing is the a proper physiologic occlusal support. Whose responsibility is to help give proper occlusal support to the masticatory system? Detailed micro-occlusion and fine proprioceptive responses is all it takes to allow the mandible and teeth to realize that the myocentric (measured) position is located dead center of terminal tooth contact in a balanced position with an anatomical orthotic and properly adjusted occlusion. Without the anatomical occlusal gearing the proprioceptive response of the TMJ patient may not in the long run maintain the necessary optimal neuromuscular balance. An optimal mandibular path of closure (myo-trajectory) and function will be greatly diminished. This has been easily observed and demonstrated by dentist/surgeons who use jaw tracking technology that measures mandibular location and EMGs that measures the timing of how the patients teeth/ bite coming together in nano seconds during any given closing/clenching cycle. Based on these detailed objective measuring technologies flat plane appliance or an anatomical orthotic appliance can be measured and calibrated to fit the needs of patients neutral muscle position, quality of their muscle function and quality of their resting modes when wearing an orthotic appliance. Hyperactive muscles will almost always want to reposition the lower jaw in a posterior and superior position (not physiologic), when occlusal premature contacts exist and are not adjusted to the proper myo-trajectory. Strained positioning of the mandible and associated structures of the head and neck will often contribute to continued tension, hyper activity, with no calmness often with flat plane appliances with flat occlusion. Dentist/surgeons who use an anatomical orthotic usually have a greater appreciation of muscle physiology and jaw dynamics in 6 dimension. They usually have recognized that detailed occlusal management to the patient is important and that the antero-posterior position and vertical positions of the mandible to the maxillary are important. These clinicians typically have come to appreciate the use of EMG and CMS (computerized mandibular scanning) technology as well as the importance of computerized mandibular scanning technology (jaw tracking) using computers to assist in locating the TMJ patients physiologic jaw location without manual manipulation intervention. They have educated themselves recognizing that when recording the bite position and occlusally adjusting the patients orthotic should not be done in a laying down (supine) position, but rather an upright sitting position which is more anatomical and physiologic due to earth’s gravity and body structural alignment. Delivering an anatomical orthotic does take more time to adjust than a common splint. Orthotic is anatomical in the occlusion to fit the form of opposing teeth. An orthotic is typically determined based on relaxed muscles using low frequency TENS to achieve a more favorable and neutral cranio-mandibular posture. A proper orthotic position is located by the use of objectively determined measurements using CMS and EMG technology to quantify the specific location of the jaw. The quality of status, quality of function and positioning of jaw is objectively measured using ADA and FDA approved technology. It requires detailed adjustments upon delivery by a skilled dentist/surgeon who understands both the gnathologic and neuromuscular principles. The complexity and severity of a craniomandibularly compromised dysfunctional patient will naturally test the success or failure of any of these techniques, but will certainly test the philosophy, skills and understanding of both the treating dentist/surgeon and patient. When the muscles can find an optimal centric terminal tooth contacting position which is more anterior to the habitual closure pattern of the jaw and where the proprioceptive programing of the masticatory system prefers to close to that unstrained muscles (myo-centric) position which allows anatomical gearing to guide and reminds the spastic muscles that there is a repeatable and consistent home base to bring the bite together where muscles can resume a normalicy for comfort, the muscles and TMJ issues can begin to resolve. No doubt an anatomical designed orthotic is a bit more challenging to handle for most dentist/surgeons because it requires more detailed skills, abilities and time to properly manage the occlusion of their TMJ patient compared to the common flat plane splint that often is inserted and adjusted within 10-20 minutes in that office visit by most doctor/surgeons. The antero-posterior position of the jaw is critical! The vertical and frontal dimensions of the jaw are also important and should not be ignored. The masticatory system wants to find a specific home base to call home every time it closes. Muscles will be happiest when the teeth/occlusion and their occlusal anatomy harmonizes in a synchronized balanced manner to one another. Once true physiologic balance is achieved the TMJ case will resolve much more effectively and quicker. Would it be easier for the TMJ patient’s jaw to rome around and search for their optimal jaw position using a splint? Should the splint be placed on the upper jaw or lower jaw? How much time is required for the jaw to search for that more optimal calmer comfortable position of the muscles and joints using a splint? If muscles are tight and strained how can one logically assume and expect the jaw to close on proper path of closure in 6 dimensions? How happy are your muscles of mastication and posture when requiring an splint or orthotic? Does the dentist/surgeon philosophically believe that occlusion is important in TMD/TMJ? Or does your dentist/surgeon believe TMD has nothing to do with occlusion?